Spray foam is an extremely versatile material, with regard to the substrates to which it can be adhered: concrete, wood, steel, and most every type of roofing material. SPF’s versatility lends it a major advantage over competing materials when it comes to roofing repairs or replacement, as costly removal and landfill expenses can be avoided by simply applying SPF over existing roofing materials. After it is applied to the roof surface, spray foam cures in a few seconds. While it completely adheres to the substrate, its expansion results in a weather tight roofing membrane. Spray foam is frequently utilized in remedial applications and adds little additional weight to the structure, given polyurethane’s low mass. A layer of protective elastomeric coating or gravel, which promotes a weather-resistant, durable, and protective surface that can be walked on for normal maintenance, is applied on top of the spray foam after the SPF has been applied to its finish specifications and proper thickness. With 35 years as a maintainable roofing medium that adds excellent insulation value to building structures, spray polyurethane foam has a long history of energy efficiency that can be reflected in low utility bills. A spray foam roof quickly dispels the preconceived notion that a “foam” roof is made up of soft foam, like the one found in seat cushions, and that could easily be damaged and require constant maintenance. Quite the contrary, SPF roofs are very durable and can handle construction and foot traffic well. Polyurethane caulking provides a simple fix when the SPF roof sustains any type of damage. Even though it is a rigid system, it can still sustain damage from dropped tools and the like. Higher density in SPF means a higher R-value and increased strength, that’s why density is important in terms of thermal resistance. 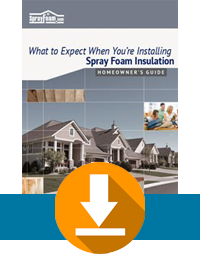 Given the fact that exact numbers may vary depending on foam manufacturer, spray foam that is 3 lb. in density has an R-value of 7.14 when installed and 6.86 when it has aged with a comprehensive strength of about 50 psi. The range in cubic feet of your typical SPF roof is from 2.5 lbs. to 3 lbs. per cubic foot. To demonstrate just how well an SPF roof insulates, we’ve provided an example. Foam roofs where installed on some new, one-room relocatable classroom buildings in a Southern Oregon school district. They installed the SPF roof systems on only some of the new buildings and not all just to see how well the SPF could perform. They installed 1.5 inches of 3 lb. density foam to the roof and added an acrylic coating system over the SPF. These classrooms were using their air conditioners at an average of 50 minutes every hour during the early spring and late fall. The buildings with the SPF roofs witnessed a 50 percent savings on energy costs, as the air conditioner usage was cut down to fifteen minutes every hour. No Seams– Spray polyurethane foam applied to the roof surface creates a seamless system, in which the seams that would otherwise allow water and air infiltration from the roof into the building are closed up. Having a seamless system also eliminates ice damming during the winter season and spray foam also builds up the roof to eliminate any water pooling and ponding on the roof that can cause significant weight on the roof and cause it to fail over time. Spray foam is a self-flashing system, which eliminates leaks that are typically seen with other products. When applied, spray foam conforms to the roof substrate so it flashes mechanical equipment, skylights, and parapet walls. Several factors revolve around the cost of an SPF roof, as it happens with every other type of roof. Typically, a basic SPF roof can start at approximately $2.50 per square. Cost can vary depending on things such as geographical location, the project’s complexity, accessibility, foam thickness, and foam coating system. Roof coatings that can reduce energy bills by up to 50 percent and reduce the amount of air conditioning needed in buildings are ENERGY STAR qualified products. These are part of the Cool Roof Program which defines certain standards in roof coatings systems involving roof reflectivity and maintenance of reflectivity. These light-colored roof coatings lower the temperature of the roof by up to 100 degrees by reflecting the sun’s UV rays and heat. Consider the average weight of traditional roof insulation for conventional built-up roof systems – it is nearly three pounds per cubic foot, whereas an inch of spray polyurethane foam weighs approximately 60 pounds per 100 square feet. A spray foam roofing system is roughly 10 percent of what a conventional built-up roofing system (600 pounds per 100 square feet). This makes the spray foam roof easy to maintain. Spray foam roofing systems can be used to re-roof and replace existing systems, as well as protect the roof of new construction. It can not only be applied to flat surfaces, but also to domed, saw-tooth, pitched, and sloped roofs. Orr Insulation is a full service Home Insulation & Commercial Roofing contractor providing Salem, Oregon and other Willamette Valley cities, such as Portland, with friendly, professional service to Residential and Commercial insulation clients. For your protection and peace of mind, we are fully licensed, bonded and insured. Click Here to See our Full List of Service Areas!